Many facilities utilize pallets or slip-sheets to convey bulk material. This can end up in a palletizing operation, a packing/picking operation, assembly, putaway, shipping, or many other applications. 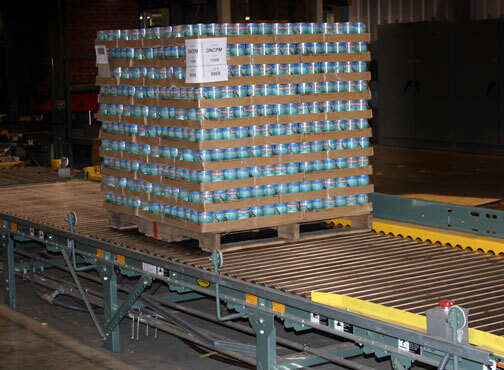 While some situations require these palletized items to only be carried the last few feet of their process, many rely solely on the pallets to carry their product throughout the operation - and pallet conveyors to transport those pallets. How is the pallet constructed? This is a vital first point of information. What's the condition of the conveying surface—typically the bottom of the pallet? Although you may think you're conveying a standard pallet, chances are you aren't. There are so many variations that it’s likely that what you think of a s a regular pallet is less common than you might think. Many pallets appear to be similar, but aren't. Careful attention must be paid to the pallet bottom deck. 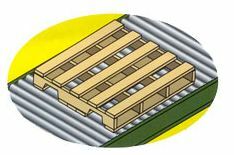 Will the pallet "runners" be parallel or perpendicular to the conveyor rollers? Perpendicular pallet orientation is always best for conveying, and parallel should be avoided if possible. If your pallets are bi-directional (runners in both directions), they can be placed on the conveyor in either direction. Actually, most pallets are one of several variations of one-way-only stringers. Some standardization occurs in the pallet industry, and further standardization continues. But many pallet types are available from a wide variety of suppliers, and you must be aware of the type or types of pallets used on your conveyor. Incorrect usage can damage conveyor or the load. When purchasing pallets, cost is a major concern, but if you are conveying them, it should not be the only factor. We can't always expect to convey perfect pallets, but the typical pallet should be in good condition if it must be conveyed. 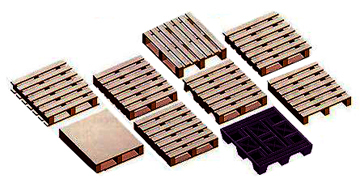 Purchase pallets that are compatible with your conveyor system.